As the weather warms up, do you crave something cold for breakfast? 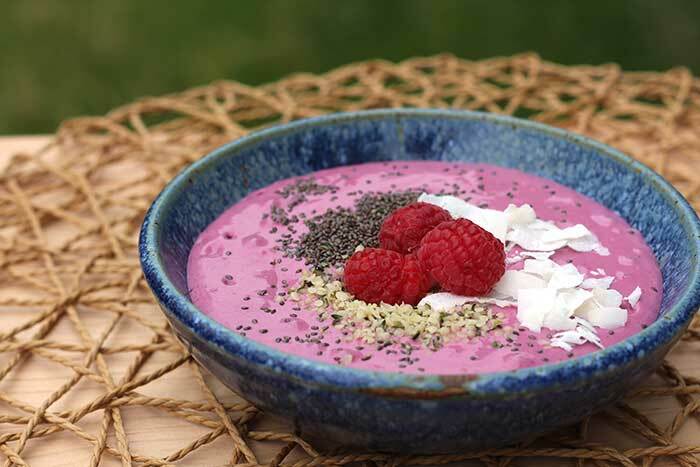 Try a Berry Smoothie Bowl made with high-protein Greek yogurt. I saw The Kitchn’s map of the most popular foods in every state according to Pinterest searches and, of course, had to check out the top picks for states I’ve called home. Minnesota went for broccoli salad, Maryland for scallops, Massachusetts for butternut squash, and North Carolina for banana pudding. But in the state where I grew up and currently live, Virginia, the most popular food search on Pinterest is for smoothie bowls. Really? Now, I’ve traveled around Virginia quite a bit and I don’t recall seeing a smoothie bowl for sale anywhere. Ever. I ordered one in Hawaii that was loaded with tropical fruit and coconut, but it was way too sweet for me. Since the American Diabetes Association lists berries as one of the diabetes superfoods, a berry smoothie bowl containing more protein and less sugar seemed like a good thing to try. Research is beginning to show that full-fat dairy may be better for people with diabetes. I used whole milk Greek yogurt in this recipe, but feel free to substitute low-fat or nonfat if that works better for you. A combination of blueberries and strawberries makes the sweetest berry smoothie bowl. When berries are in season (meaning ripe and sweet), you may not need the honey. The CompostMaster and I got used to smoothies featuring almond butter, chia seeds, and hemp hearts when we did the 10-Day Detox. If you want to ease into this type of (less sweet) smoothie, try just the yogurt, berries, coconut water, and honey first. Then add the almond butter next time and see what you think. Then add the chia seeds, then the hemp. Do try the chia and hemp eventually, though, as they are loaded with healthy fats and protein. If you have trouble finding chia seeds and hemp hearts, try amazon.com (affiliate links). I like to use frozen berries in the smoothie part and fresh berries for garnish. This makes the smoothie bowl colder. If you prefer things to be less cold, use fresh berries for both. Blend yogurt, berries, almond butter, hemp hearts, chia seeds, coconut water, and honey in a blender until well-combined. Pour into a bowl and garnish with coconut and fresh berries. Nutritional information does not include coconut and fresh berry garnishes. I used whole milk Greek yogurt. If you're watching your fat intake, try low-fat or nonfat plain yogurt. Skipping the honey will save you 3g of carb. What beautiful colors! Yes it is a yummy one. But they just always look so pretty! Mary – Thanks so much! Yum! This recipe takes me back to my vacation where we attempted something comparable. Cannot wait to use this one. Vanessa – Same for me! I had my first smoothie bowl in Hawaii, but it was way too sweet for me. This one is definitely less sweet.